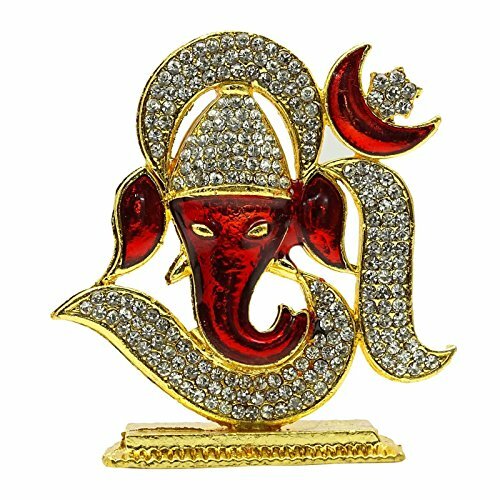 * Beautiful Brass Lord Ganesha Om Statue Décorated With CZ Stones. * Material: Brass. * Size: Height 2.5" Length 2.3" Width 0.7 " Inches. * Weight: 78 Grams. * Color:Gold And Crimson Red. * Made In India. * You can use this figure anywhere. Its Look Excellent in your Car dashboard home or office table Décor. Best for gift. You can use this figure in Décorative purpose. Size - Height 2.5" Inches Length 2.3" Inches Width 0.7 " Inches. If you have any questions about this product by stylewise, contact us by completing and submitting the form below. If you are looking for a specif part number, please include it with your message.